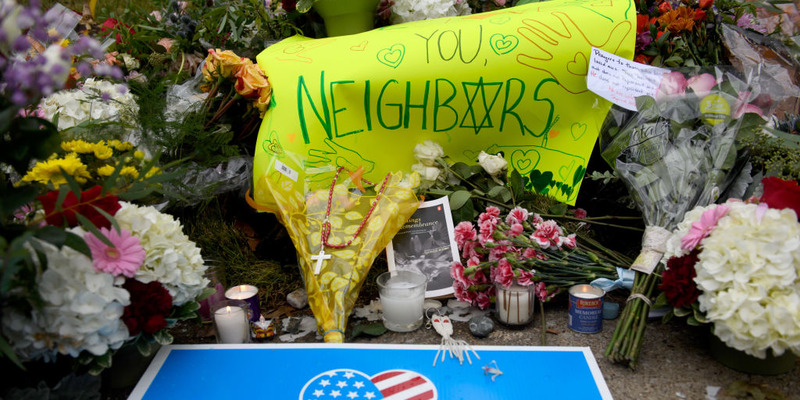 Jeff Swensen/Getty ImagesMuslim groups have set up fundraising campaigns for the victims of the Pittsburgh synagogue shooting. Here, a makeshift memorial down the street from the site of the shooting pictured on Sunday. A crowdfunding campaign started by two Muslim groups has raised more than $US110,000 for the victims of the Pittsburgh synagogue shooting on Saturday which left 11 people dead. The campaign was set up through the platform LaunchGood, a crowdfunding platform focused on the global Muslim community. The funds will help cover the “immediate, short-term needs of the injured victims and grieving families,” such as funeral and medical bills. The campaign surpassed its initial goal of $US25,000 within six hours of launching on Saturday. The campaign was set up through the platform LaunchGood, a crowdfunding platform focused on the Muslim community worldwide. The campaign for the Pittsburgh shooting victims was started by Tarek El-Messidi, who is a Muslim-American social entrepreneur and speaker, according to his LaunchGood user account. The fund is also in partnership with the Islamic Center of Pittsburgh, who will work directly with the Tree of Life synagogue – where the shooting took place – to distribute funds to those affected, according to the campaign’s LaunchGood page. “No amount of money will bring back their loved ones, but we do hope to lessen their burden in some way,” the campaign wrote. As of 3 a.m. EDT, the campaign raised over $US110,000, far surpassing their initial goal of $US25,000. The initial target was reached in only six hours since it began on Saturday, according to the campaign. The campaign had gone viral and hit its second goal of $US50,000 in just one day. “Through this campaign, we hope to send a united message from the Jewish and Muslim communities that there is no place for this type of hate and violence in America,” the campaign organisers wrote. Eleven people were killed and six others were injured when a gunman armed with an AR-15 and handguns stormed the Tree of Life Synagogue in Pittsburgh on Saturday. When police rushed the synagogue in the Squirrel Hill neighbourhood, they were met with gunfire. The shooting is believed to be the deadliest attack on Jewish people in US history, according to the Anti-Defamation League.